Welcome to Macro Flowers Saturday on this beautiful weekend! 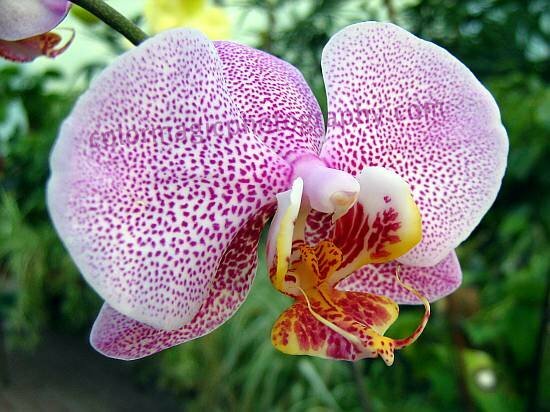 Orchids are gorgeous flowers as long as they are in bloom. After the flowers are gone you end up with a poor looking foliage and a lot of pampering, hoping that you will see those beautiful flowers again. All my orchids brought new spikes over this winter and leaves as-well, but the buds are drying and falling off (except on one orchid of ten). Nothing has changed in their environment, except the season. The diagnoses for bud blast can be just about everything; too much watering or not enough, too high temperature or too low, not enough light or anything else that you will never find out. I believe, orchids are the most unpredictable flowers ever, when they are not in their native habitat. 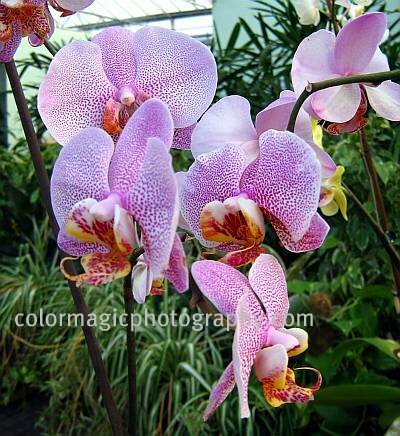 The photos of these beautiful white-pink Phalaenopsis orchids with purple spots were taken at the garden center, were I often waste my money on these overly picky flowers. Join Macro Flower Saturday and share with us your beautiful flowers! If you are new here, please read the info on Macro Flowers Saturday page. Entries with no backlink will be deleted. Due to some last minute modifications at Linky tool, I had to choose another service for the list. I'm just learning my way through the new instructions, so please let me know in the comments if you have any kind of problems. These are pretty! I call them freckled orchids! Wow, we do not have that kind. Right now there are no flowers in Heaven. It gets chilly at night and windy during the day which dries the soil fast! But we all love this rare weather! For now, the flowers are asleep! Wow! I am without words, these are so stunning! I've never had any success with them either. But my sister who ignores and kills most plants has actually gotten them to rebloom, so my guess is too much water for your bud drop, and I do know they hate direct sun but of course must have lots of bright light. I'm with you. Do easy. Gorgeous blooms. I would love to grow orchids but as you said they are too picky. The orchids are gorgeous! I am featuring ornamental banana flower today. Hi Maia, I really like the new select a photo linky! I always had trouble remembering which photo I posted in the post, since I have so many similar named files. This new way is great! Thank you for always striving to improve your meme! Those are really lovely. I understand how you can't resist buying them. I do that often enough to know! I stopped by the orchids that are being sold at one of the big discount stores right now. But I don't have good light, and they just don't thrive. Your photos are fabulous!